You know I am always shocked when I look at the blog and realize that almost a week, or more than a week, or some other unspecified amount of time has flown by. On the one hand, I kind of know it has been a few days, on the other I am left to wonder what happened to those days?? I do know that I am suffering and early and severe battle with spring fever. Yes, already. It is frickin’ cold here, and frankly I am tired of the cold. For so many of the winters I remember, there were days when I had to throw open the windows to get some fresh air, and enjoy the balmy weather. Not every day, but enough in between the cold that it didn’t seem so …. cold. You couldn’t pay me to open a window this winter. I don’t even want to open the door long enough to let the dogs out. I know Colorado is supposed to be cold, but that was just a myth we spread to keep people away!! But the cold has me pulling out winter wear I have not seen for years. I own coat, I own gloves, I own a hat. well actually I owned several of all of the above, but I have children. 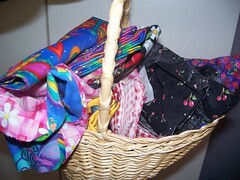 After snow-melts hubby and I actually have to go through the yard to collect a variety of abandoned winter wear. We are not sure what makes our children head out into the snow fully dressed only to come back in marginally clothed. We are not sure we want to know. Nevertheless this habit can be mighty draining to the winter wear collection, especially when the snow WON’T MELT!!!! Anyway, what it all boils down to is that my ears were getting cold in the morning, and I was becoming unpleasant because of it. 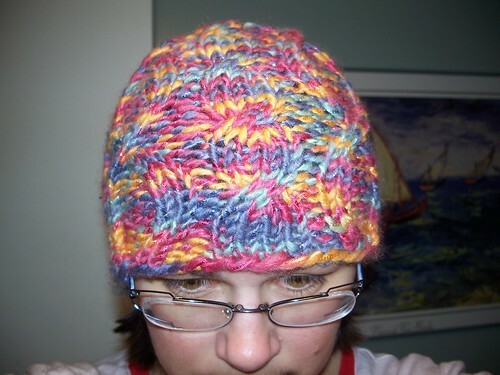 You may recognize it as the Yarn Harlot’s unoriginal hat, in my favorite affordable woolly blend – Mosaic Twist. I really need to dream up some matching mittens, but the thing about matching is that it draws the attention of the teenage daughter. Teenage daughter squirrels away my matching things (like socks, I find all my matching socks on her feet, and only single homeless socks in my drawers). Thankfully teenage daughter is tiny. She cannot wear my clothes. It is only a matter of one shoe size before I am barefoot though, and I think my cute flip flops may already be in danger when if summer arrives. 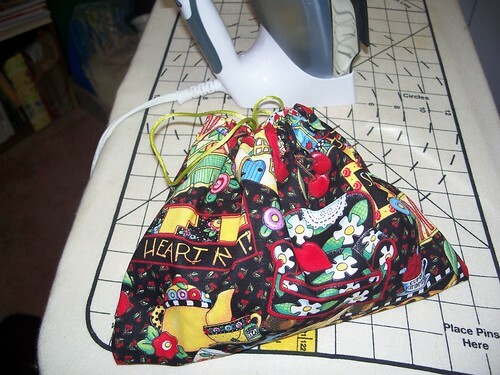 As promised, you want fast easy pouches…you got it. 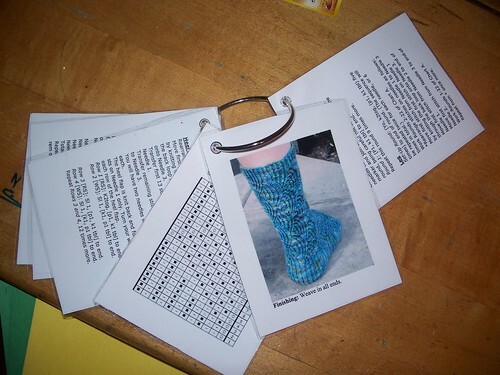 I have made a few small ones for sock projects, but the same concept can easily be applied to make one any size you need….. I have made a few different kinds of these, some with square bottoms and other kinds of heavy construction but found these to be easier and a touch more versatile. 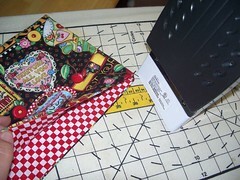 Two coordinating fat quarters (or one if you want the lining and the outside of the pouch the same), scissors, a sewing machine (you can hand sew if you are veeerrrryyyy patient) some method to mark your fabric (chalk or fabric pens) a large safety pin, and some ribbon or cord to use as the drawstring. If you like you can get one of those fancy cord grippers to keep it closed, but I usually just slip knot mine. 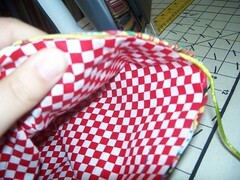 Personally I have a little stash of fat quarters. 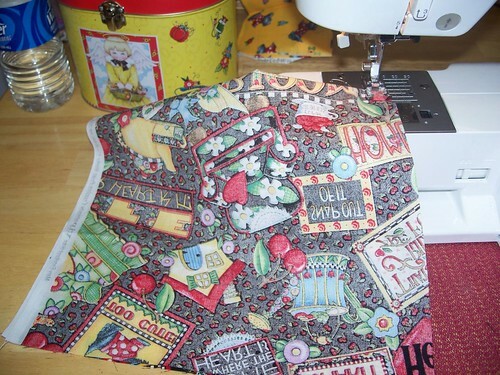 I think fat quarters are about the cutest things ever, especially if they come in matched sets tied with ribbons or string….I habitually purchase ANY fat quarter bundles I find on clearance, and I keep them in a little basket, and use them whenever misc. ideas jump into my head….. 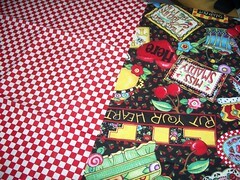 Grab two coordinating prints that make you happy…… Really, you can just use one, but then your lining and the outside will be the same!!! Which leads us to our next step, press those fabrics into submission (relative squareness, this helps A LOT… trust me, just do it. ) 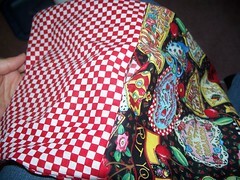 Now cut them in half… you should get two approximately 11″ x 18″ pieces from each fabric. 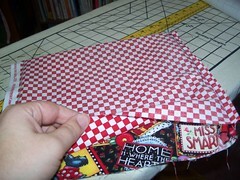 Fold each piece in half RIGHT sides in, so that you have an 11″ x 9″ rectangle. Sew UP from the fold on the bottom to the top edge on both sides, leaving at least 1/4″ seam allowance, you can leave more if you like (or if you lazily leave the selvage edge on). I always sew up from the bottom, if the top turns out uneven, you can trim it, but if you sew down, and the bottom fold is uneven…wonkiness ensues. When done you should have two like this…. Here is where it gets fun! 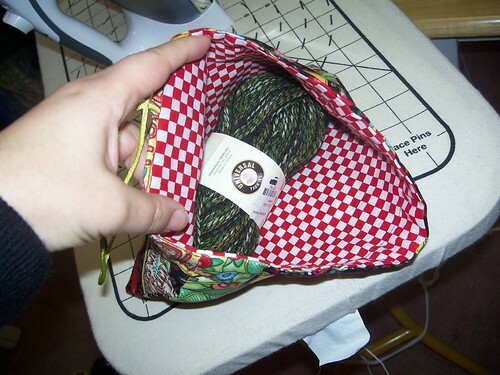 Turn the outside fabric right-side out, and place the outer pouch INTO the liner pouch, essentially you should have a little bag with the right sides together on the inside, and the wrong-sides facing you…. 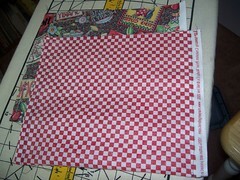 Give the two together a happy little shot of steam or even a good press, and lay it out in front of a ruler. 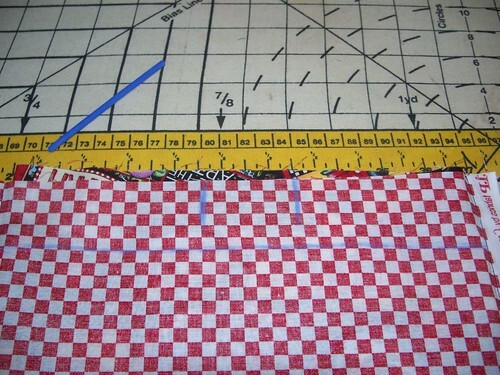 From the top, mark 1 & 1/2″ (you will be sewing across this line….) now find the top center and mark off one inch each side from the top center. 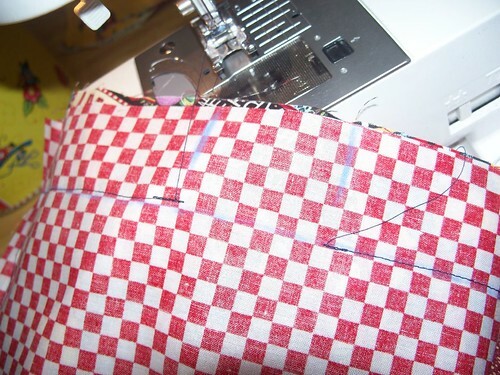 You will sew across the horizontal line all around the top of the bag EXCEPT for the two inch area marked off by the vertical lines. 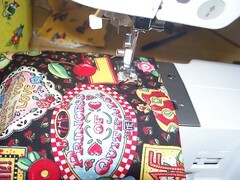 Sew all the way around the top perimeter of the bag starting from the outer mark, and stopping at the inner mark. Now is a really good time to trim all those loose thread ends, as it is your last chance. 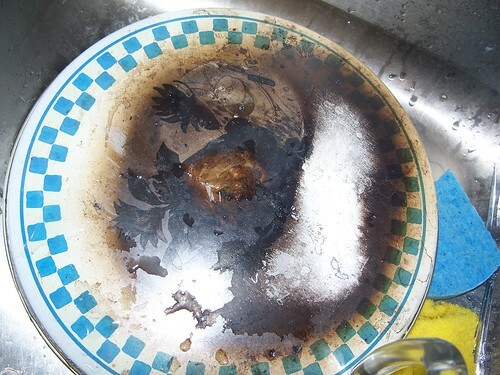 Dark floater threads can often be seen through a light colored liner. If you think they won’t show feel free to ignore them 🙂 Using the little two inch hole at the top turn the whole mess inside out…..
Once again hit the iron, a good pressing can make even rubbish look fairly good at this point, so go for it…. All that’s left to do is thread through the cord, use your safety pin like a giant blunt needle, pull the cord through the top drawstring channel…. 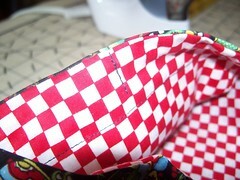 And voila: finished pouch fit for a sock! Recently, my son and I saw a show featuring razorbacks… after a series of questions, I chose the easiest explanation…. A razorback is a type of pig. At least a week later, during play, the child asks about the shaving pigs. I am ashamed to say, dear hubby had to rescue me and explain that the child was referring to razorbacks. Sigh. 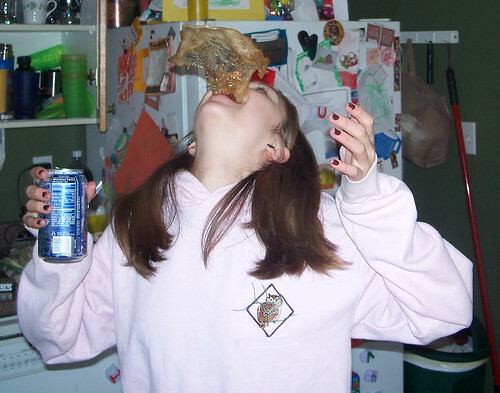 I am beyond kissing the pig, I am shaving it. Take that however you want. Yes, I did laugh. A Lot. Yes, she did clean the kitchen. A Lot. 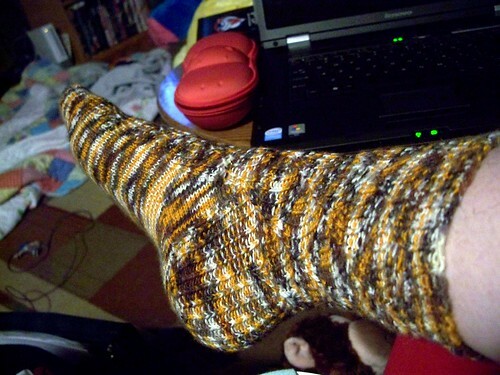 Just to solidify the brilliance of teenage logic, she did think her head “might” explode…..
How’s about to distract from my brilliant prodigy, I show you a finished sock? One pomatomus down, one to go…..
After much internal debate, I have decided to finally move the Blog. MSN Spaces is a lovely friendly place for me to publish, but it is not very reader friendly. Part of the point of blogging (for us knitters anyway) is to be a part of the knit blog community. It is very hard to be a part of a community when the publishing software you use makes things difficult for others. This used to be a burner cover. Um….used to be. Yesterday when putting on water for tea, I took the burner cover off of the front burner, and stacked it over the back burner cover. Later as I am sitting at the table wondering why the heck my teapot is not whistleing yet, DD arrives to ask me what the heck I am cooking because the house really stinks…..my brain finally leaps into action and realizes I have the WRONG burner on! After some pretty interesting gymnastics with tongs and hot pads, the correct burner was turned on and I was stuck with the evidence. When hubby got home, I explained what I did, he gently offered to go grab the other set of burner covers, only to find that two of them are a burnt match to this set. I am left to decide whether burner covers are a good idea or a bad one…….but I have been spared twice from burning the house down, and this just adds to my paranoia about appliances being left on when you are not there to watch them….. In other news there has been actual knitting! 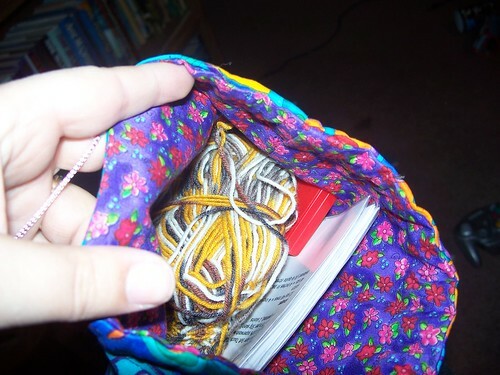 AND sewing, AND creative pattern printing…..As long as I have been kntting on dpns, I have always just tossed the project into whatever bag I have. Since these items are usually small and compact this has been no problem, except that little dpns LOVE to get hooked on everything. 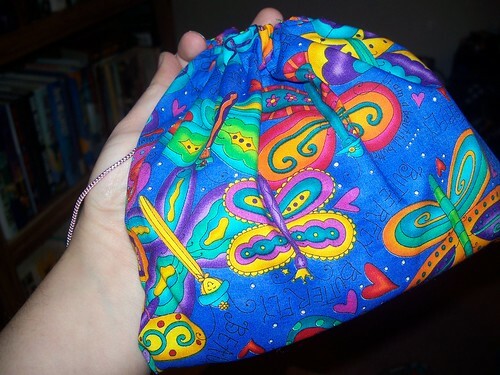 So I find all these cute instructions for little sock pouches and now I MUST have one!! 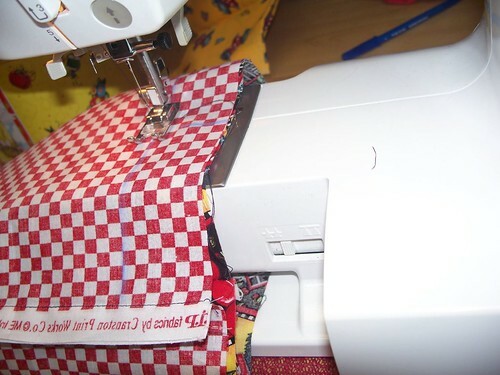 I pasted the pattern onto the 3×5 template in word and then laminated the little cards, a rivet and a split ring, and now I have a totally portable project that can be quickly moved from bag to bag…. 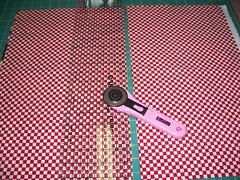 I wouldn’t work this hard for a pattern I intended to use just once, but for patterns that will probably see some revisitation…..totally worth the work! Well, it has been fun, but after much internal debate, I have decided the blog must move. MSN has been a happy place for me to host, but not so happy for those interested in keeping up with the blog, commenting or interacting in any way. as always my domain www.mintlatte.com will forward you to my blog as well. And I am back to the grind 🙂 It is a slow day at work, so I am taking advantage of the time to clean up after so many not-so-slow days… weeks….months….. WAIT!!! I thought of one!! To remember to write the year 2008 on things rather than 2007 before February! < I guess I could probably put this one on every year, but I have always scoffed at those who resolve to do things they will never do every year. Oddly enough I have no great retrospective on the past year either, it was a very nice year, with lots of little nice day to day things that added up to being almost ideal overall. Boy is a preschooler, now really, no kid can mess up preschool, and mine is doing quite well at it this year….so how can you NOT like that? Girl is…well….girl. At 13 she is perfect in her own mind. Thirteen will never be the age of paradise…..so I take that into account when I say that things are still pretty OK, and with thirteen, pretty OK is a good thing. All in all, may it suffice to say, that having lived through yet another year, I look forward to the new one. So if you are unfortunate enough to be at such a loss of blog feeds that you have found your way to mine today…. Happy new year, may you craft in relative peace and happiness!